Argentina spans a massive 2,263 miles (3,650km) from north to south, giving the narrow country a huge variety of landscapes and attractions ranging from the desert cattle ranges of the Pampas in the north to the glaciers and penguin colonies of Tierra del Fuego in the south. In between those extremes lies the sultry heart of Argentina, Buenos Aires. The birthplace of the tango, Buenos Aires is a fascinating city of history and culture and is overflowing with amazing restaurants, theatres, nightclubs and dance halls. Two hundred and thirty miles (400km) south of Buenos Aires lies Argentina's most popular beach resort, Mar del Plata, which attracts around three million local tourists every summer. Many of Argentina's most popular attractions are not in the cities however, but spread across its verdant landscape. The famous Iguazú Falls, voted one of the natural wonders of the world in 2011, draw tourists from all over the globe, as do the excellent vineyards of the wine region in Mendoza, and the popular ski resorts Bariloche and Las Leñas. 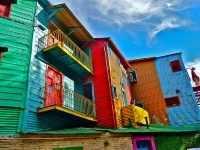 Argentina is a patchwork made up of colourful panoramas and even more colourful people. A hugely popular tourist destination in South America, a holiday in Argentina is an adventure likely never to be forgotten. The weather in Argentina varies widely from north to south, so deciding the best time to visit Argentina depends on where you're going. The best time to visit Patagonia and the southern region is in summer (December to February) when temperatures are moderate; while the northern region and Iguazú Falls are best visited in winter (June to August) for the same reason. The best time to go to Buenos Aires is in the spring and autumn (September to November and March to May) to avoid extreme temperatures and large crowds. The ski season in Argentina runs from June to October. Read more on Argentina's Climate and Weather. -Visit Iguazú National Park and the only remaining Guarani settlements in Argentina. -See the grand Casa Rosada, the bright pink home of Juan and Eva Peron. -Hike on the spectacular ice formations of Los Glaciares National Park. -Visit the penguin colonies in southern Patagonia. Read more about Argentina Attractions. -Learn to tango in the nightclubs of Buenos Aires. -Go skiing at Argentinean ski resorts like Cerro Catedral and Los Penitentes. -Sample local wines in the vineyards of Mendoza. -Go white-water rafting down the Rio Manso in the Parque Nacional Nahuel Huapi. Read more about Argentina Activities. Getting to Argentina is a long process, as flights to Argentina from London take between 11 and 16 hours. There are direct flights to Argentina from a few major US cities, as well as London. Most flights to Argentina land in Buenos Aires at Ministro Pistarini International Airport. Get more information on Argentina Airports. On Heroes and Tombs by Ernesto Sabato, and Evita: In My Own Words by Eva Peron. Evita (1996) and Naked Tango (1991). Hot empanadas and Dulce de Leche. Argentinean wine, tango albums and leather goods like handbags and jackets. Bring some nice clothes for evenings in Buenos Aires; restaurants and bars lean toward chic dress codes and casual establishments can be hard to find. See the twirling dancers at the Buenos Aires Tango Festival in autumn. The world's best polo players show off their talents at the Argentine Open every summer. Listen to traditional flamenco guitar at the International Guitar Festival, held each October. More information on Events in Argentina. -The official national sport of Argentina is pato, a combination of polo and basketball. -Thirty percent of Argentina's population lives in Buenos Aires. -The largest dinosaur to ever walk the Earth was discovered by a Patagonian shepherd in 2014. The sultry lure of the tango and colourful culture of Argentina makes it an exotic and romantic holiday destination.